How do I set up my account with the Education Partner Program? You've been approved for the Education Partner Program. These are the next steps to get your account set up. The first step to getting started is creating your account. We will link your Education Partner Program access to the account that you create, but first you need to create an account. 1. Log into your account or create a new one with the school email of that class. 2. 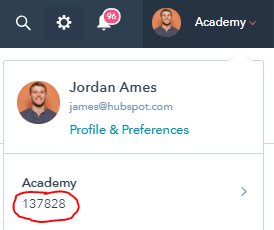 Once you have created your account, you need to find your HubSpot ID#, the 6 or 7 digit number that is visible in your URL and also in the top-right of your portal. Please submit your HUBID # here. 3. Next, get your students access to all the resources. Follow these steps to add your students as users in your HubSpot account. This will send them an invitation to create their profile within your account. 4. Do you want access to the marketing software? If so, fill out this form and we will give you access. Please allow 1-5 business days for us to complete your request.